Man was it ever blowing. Caught bait some how and picked up a 9 am. Winds were at 20 plus gusting to 30. Told the clients no going on the outside and we could cancel if they wanted to. They said lets have at it. We stayed on the main shore line and it was still brutal trying to fish. Went to run up to the north and see this pontoon boat headed for the sand bar across the sound. I made the comment that boat looks over loaded and they must be idiots to try and cross the sound. Soon after I see all types of LEO boats running with lights flashing. Get back to find out they capsized with 13 on board, none with life jackets on and all in the water. All saved and 2 transported to the hospital. We stayed in the back and managed some snook, reds and jacks. 13 on a pontoon was a disaster waiting to happen; I wish these fools would learn before someone drowns (again). Some of them did not know how to swim. Right. 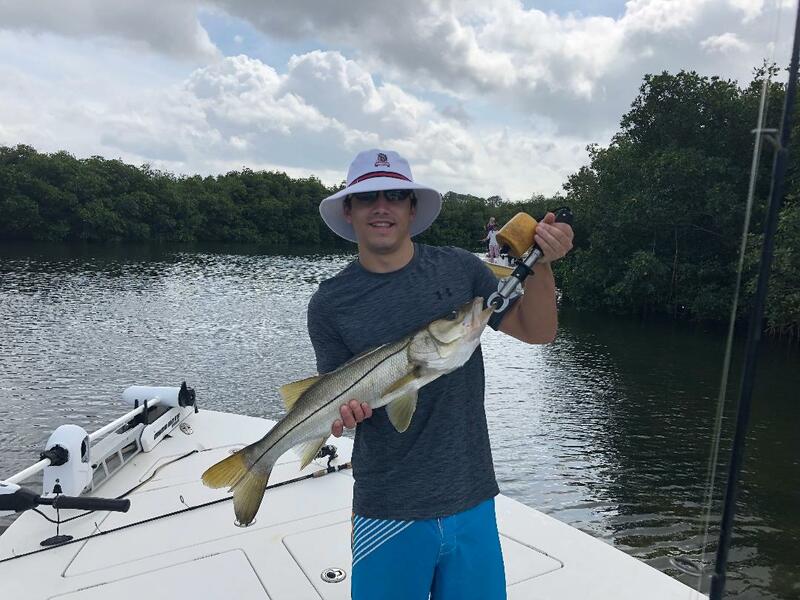 Any day I get a snook like that is a great day !! Rental pontoon from Care free boat rental at Port Tarpon. Left the marina with 8 on board. Stopped at the park and picked up 5 more as the rental company would not permit the over load. They also added a lot more gear at the park. 8 PFD's only and some non swimmers and 5 of them were kids. Had it not been for a larger boat see them go down it would have been bad. Pasco County LEO on scene first. Their newest boat did not have a boarding ladder. Had them stepping on the trim tab to get people on board.😏 Rumor has it some alcohol was involved and the boat was torn all to heck. Dumb luck made this a rescue and not a recovery. Investigation is ongoing! There are so many faults in this it's crazy. Ya know Capt. just when you think you have heard it all!!! Already informed by the rental company the max load was eight and they sneak down the waterway and add five more....jeeez! Goes to show there is no cure for stupid! Oh, there is a cure for stupid, but sounds like there was an intervemtion to prevent it. Wouldnt wish the cure on anyone though.